With all the incontinence supplies on the market, how can you find one that will work right for you? The best way to find urinary incontinence products that you like is to try out a few samples. You will need to consider the fit of the incontinence underwear. Fit is important as it gives you comfort but also guarantees that you will not have leakage to worry about. Cost is another thing to consider as the disposable incontinence underwear can become expensive in a hurry depending upon the frequency of your incontinence episodes. If you want to try using adult cloth diapers you can easily find ones that are comfortable but you may have a concern around leakage. It’s not a secret that cotton on it’s own can easily lead to leakage problems so you might want to consider looking for some adult plastic pants that can help. The plastic pants can be worn over the top of your incontinence underwear to hold in any excess urine that does leak from the underwear. The plastic pants have really progressed as they are not longer noisy and noticeable. 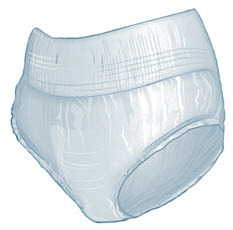 There are many different types on the market and you can find a pair of plastic pants that is quite discrete but even comes with liners inside, helping to control odor and urine leakage. When you are looking at the various types of adult plastic pants that you can choose from you really want to look for a pair that comes with a very small amount of plastic material so that it doesn’t make that crinkle noise when you walk. If the plastic layer is too thick it is what will cause you to have noisy problems when you walk and this is hard to deal with as it will not allow you to keep your concerns with incontinence discrete. Plus having too much plastic can lead to bunching under your clothes. Watch this video: How to choose the right incontinence products for you or a loved one Just like when you are shopping for the right adult diapers to wear you have to consider the comfort of your plastic pants. Having plastic pants that fit right and do not pinch your skin will help you in managing incontinence effectively. If the plastic pants do not fit right they will rub on the skin but they can also cause you to constantly tug at them to adjust them, which could let urine escape. Sizing is important when you are choosing the right type of incontinence supplies. You must find products that are going to fit correctly or you could end up with leakage. The other thing with sizing is that it can change with each brand. You need to look into buying several different types of plastic pants so that you can find the one that will have the right fit for your body type. Some of the washable adult diapers are sold with plastic pants, which can help you a lot but you still need to look at other options as well when you are trying to find plastic pants that are going to give you the right comfort and size you need in case these do not fit well for your needs. Are the plastic pants meant to be worn at night? You need to read the instructions as sometimes the plastic doesn’t allow for air flow to get into the underwear to help keep you dry. Using the plastic pants at night is one thing but it is something else to use them at night so you may want to opt for adult overnight diapers at night or consider using incontinence bed pads with your washable incontinence underwear.